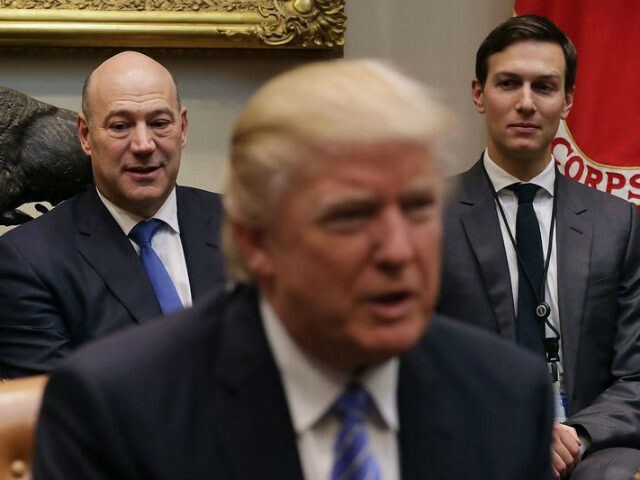 27 Aug 2017 Washington, D.C.
First, National Economic Council (NEC) director Gary Cohn—the former number two banker at Goldman Sachs and a top Democrat who joined the Trump administration after the president’s election—bashed the president in an on-record interview with the Financial Times. The New York Times also reported that Cohn drafted a resignation letter, and came under enormous pressure from his own family including his wife to resign, but has remained in the White House. “Mr. Cohn, who is Jewish, seriously considered resigning and even drafted a letter of resignation, according to two people familiar with the draft,” the New York Times’ Maggie Haberman and Kate Kelly wrote on Friday, adding later in the piece details about Cohn’s plans for potential resignation. The Washington Post added in its own reporting that Cohn was overheard in a Long Island restaurant trashing President Trump. In addition, Tillerson defended globalists arguing that he does not “see any division” between those who support globalization and those who support the “America First” agenda that the president campaigned on. Gorka resigned from the White House on Friday in part due to the failures on the Afghanistan speech and vision from the president, which were pushed in large part thanks to National Security Adviser H.R. McMaster. Together with Cohn, McMaster, and Tillerson, others in the White House have banded together to form the “West Wing Democrats.” They include the president’s daughter Ivanka Trump, her husband Trump’s son-in-law and adviser Jared Kushner, Deputy National Security adviser Dina Habib Powell—who worked with Cohn at Goldman Sachs—as well as new chief of staff John Kelly. Powell claims to be a Republican due to her short tenure in the George W. Bush White House, and Tillerson was a longtime GOP donor, but this cadre of individuals and others reportedly view their role as moderating the president’s campaign positions to protect the established order and status quo in Washington. They work closely with congressional leaders like House Speaker Paul Ryan and Senate Majority Leader Mitch McConnell to achieve their ends against the president’s agenda. Interestingly, as Cohn and Tillerson were publicly attacking the president over the weekend, so was Ryan—for a different topic, the president’s decision to pardon former Maricopa County, Arizona, Sheriff Joe Arpaio. White House interim communications director Hope Hicks has not replied to a series of questions from Breitbart News about why the president is letting these people get away with this public humiliation of him, and how it shows weakness on his behalf. It remains to be seen if the president will do anything about it, but the display of lack of control of his own supposed allies weakens his position heading into what is likely to be one of the bloodiest legislative months in recent history. In September, Trump and Congress need to pass a spending bill, raise the debt ceiling, revisit efforts to repeal and replace Obamacare, and begin tax reform.